Long ago, I received the best business advice for accelerating performance: Find the smartest people in the industry and learn from them. Whether you’re a budding director with dreams of the big screen or the director of marketing charged with scaling content across the enterprise, finding the right people to learn from is essential. When it comes to content marketing, you really can’t go wrong with Carlos Abler from 3M. Carlos is the Leader of Content Marketing and Strategy: Global eTransformation at 3M where he developed the Enterprise Content Strategy and Marketing Acceleration program. 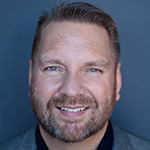 You may have heard him interviewed for the Content Marketing Institute’s Pivot Podcast or seen him present at a number of content marketing conferences. 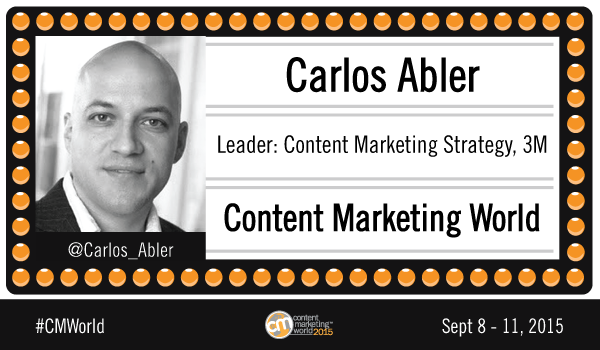 In September, Carlos will be presenting at the 2015 Content Marketing World. To whet your appetite for his Content Marketing World presentation, we sat down with Carlos to talk about content marketing, content strategy, and how to develop a content marketing culture across a large enterprise. The über-deliverable at 3M is content culture transformation as an essential pillar of digital transformation. In your current role as Leader, Content Marketing and Strategy, Global eTransformation at 3M, how has your approach to content marketing evolved or changed since you started? For me it was a radical change compared to past practice. Before 3M my career was focused on producing, directing and creating content and applications. At 3M the goal is to enable and scale content excellence as a capability for a $30 billion dollar company with 30 divisions and products for just about every vertical known to humankind. So the über-deliverable at 3M is content culture transformation as an essential pillar of digital transformation. The deliverable of content excellence within an organization is quite different than delivering excellent content. Fortunately transposing what I do into tools and practices is a very natural thing for me to do. My analyst friends tell me it’s unusual to have a dedicated role with content in our title doing the kind of thing I am doing. Rebecca Lieb referred to Michael Brenner and I as unicorns. So I deliver rainbows. That’s different. Content strategy is a selling term, not a doing term. How do you define content marketing vs. content strategy? How can they work together better? Content strategy is a broad term for an array of practices for managing the lifecycle of content. I tend to define the term historically because I never use it for a practical purpose. Ever. Content strategy is a selling term, not a doing term. I use terms like content operations, content organization and content supply chain. Strategies involve trade-offs toward a goal. The inherent trade-off underlying content strategy is between winning or not winning with content. It is like saying our breathing strategy which ladders up to our goal of not dying. With content, the term strategy only becomes useful as a modifier when focusing on facets of the practice. If your content isn’t a product then it’s not content marketing; it’s just communication. Content and application marketing is the practice of delivering meaningful content products and applications relevant to helping people achieve their goals and/or serving their experiential interests; a parallel marketing effort for the purpose of increasing brand relevance and supporting the sales and relationship goals of other products. Content marketing has self-contained value. If your content isn’t a product then it’s not content marketing; it’s just communication. I include applications. Applications are just as critical: They are how the content may be delivered, consumed and acted upon. I explicitly call out both the practical and experiential. I call out that content marketing is serving the goals related to marketing of other products where content is not the core revenue stream. How do ‘content marketing’ and ‘content strategy’ work together? Content lifecycle practices enable content marketing to be successful, while content marketing imposes requirements for what your content practices must be to enable success. They work together better when organizations ensure both practices are alive and well. So in summary: Content strategy is a broad concept of organizational practices for effectively managing content lifecycle; content marketing is a specific application of content to add value to an organization’s relationship with people. Content strategy enables content marketing and content marketing defines the requirements that content strategy must serve to enable it. Content is both a vertical and horizontal pillar of the overall marketing and audience relationship practice. Where do you see content fitting in with the overall digital marketing mix for most large, complex organizations? Do you think content should lead or follow with most digital marketing strategies? I don’t see content in a leading vs. following dynamic. I see content as both a vertical and horizontal pillar of the overall marketing and audience relationship practice, inseparable from many marketing and all relationship activities. The concept of content “leading” could be said to apply in addressing an individual who has no familiarity, and you use content marketing to establish a relationship prior to promoting other products. But that would only apply tactically to that particular relationship stage. Content marketing as interactive and as a vertical and horizontal pillar is true irrespective of company size. The only differences are orders of scale, federated complexity, and sophistication of infrastructure. Once strategic planning is in but before the organization has built out a tactical plan is the perfect time to insert detailed cross-functional content marketing workshops. Marketing, sales, customer support, technical services or any other key customer facing function are involved across all processes, from information gathering for planning input, to the workshops themselves. Again, it is not a lead-follow situation. It is intensely iterative. Most large companies are challenged to scale a culture of content creation across the organization. What are some insights you can share with industry peers in terms of how to improve content marketing adoption across the enterprise? Have all of your core content processes, especially upstream strategic process be fiercely collaborative across customer facing functions. The single most important thing is cross-functional collaboration from the very beginning. Your tactical intel will be more accurate, your assets will actually serve the nurturing process, and you will establish the human-to-human feedback that no technology can replace. Find people who are truly focused on the customers’ needs and goals. It helps if these are the same people or are partnered with people who have a content responsibility for these audiences. Accelerate identification of the topics and help that customers are in most dire need of. The faster you get to that, the more grounded in direction tactical discussions and planning can be. Deploy processes and tools that help people be responsive to the dynamics of content performance. Once they see what the pace looks like for revisiting the hypotheses of their editorial calendars and how feedback iterates on that hypothesis, people get excited. Help people understand how content can map to the macro-stages of the customer lifecycle, and to the micro-stages of the various subscription transaction, decision support journeys that are contained within that lifecycle. It’s amazing how much people just shoot in the dark and hope they hit something as they check the box of marketing activities. It’s just that with digital technologies they are shooting in the dark with fancier machines. Help people identify their optimal publishing rhythms. It helps the organization rightly plan for the skills and resources required. Assign roles with content responsibility and ensure they have the time, skills and production resources required. As a champion of content you need to cultivate relationships based on service with anyone and everyone in the organization who are champions of content. Build alliances between siloed entities. In big companies you never know when a subsidiary is already a year and a half into an initiative that just needs to be scaled versus just starting it from scratch. Create centralization sparingly and empower independence. Centralizations should really be focused on essential control points, economy of resources, and effective service and asset delivery. Ensure that content is managed in a manner that is findable for repurposing. If people don’t have to re-create the same assets over and over, their entire program will accelerate. Help the organization quickly develop a hypothesis for what publishing channels to focus on, and what they expect to achieve from each one. Media channels as choreographed network is the key concept. Run Pilots. Push to get content lifecycle technology gaps filled. Cultivate true believers invested in the systems. Have answers to every question imaginable about content. You need to be ready to be that go-to person. Have documented processes tools and templates ready to go yesterday. Build your documentation and tools as though you have been given a hundred million dollars to build the dream team of all time. Tell the story of content and providing foundational case examples that you continue to refer to time and time again. Get some examples and repeat them in the context of where and how they add value. These types of solid concepts have proven helpful in fostering a productive mental model. Create big picture visions of what federation and alignment looks like across the content and organizational eco-system. Help people see outside of their silo and have a big picture view. Have a vision of the future. The most futuristic possible. Really push it. Of course you want to have all sorts of near term feasible visions with incremental steps forward, the patience of a tree, the perseverance of tectonic motion, and release potential of a tsunami; but you never know when you will have those champions who want to dive in and envision with you. Scale strategy as a service. An often overlooked concept is the notion of how to deliver strategy services at scale. These strategic content services resources should be embedded into fundamental marketing processes upstream from stages where agencies typically get hired. Just do all that and you’ll be fine. Want to learn even more about content marketing? Read The Big Picture of Content Marketing Strategy below featuring advice from marketing executives at companies like Marriott, IBM and Eloqua as well as industry thought leaders Robert Rose, Kristina Halvorson and Jay Baer. Interesting that he lists 20 ways to “improve content marketing adoption across the enterprise…” but not one of those 20 is to measure it to prove it works. Isn’t it safe to say that people wouldn’t have to adapt if they were already bought into the concept?